As you can see from US City Open Data Census, many cities are making their data open. There are many guides and best practices learned from those cities, to publishing open data that countries/states/cities. Summary and links below for those interested! Introduction: What is open data, and why bother? Buses (transit data), Bullets (crime data), and Bucks (budget and expenditure data). CKAN -- the Comprehensive Knowledge Archive Network -- is open source software powering open data platforms across the world. Provided by the Open Knowledge Foundation in the UK, CKAN is used at the local, regional, national, and international levels of government as well as in academia. DKAN is a Drupal-based implementation of CKAN that offers an easier installation and support burden while preserving API compatibility. OpenDataCatalog (ODC) is open source software originally created by Azavea for the city of Philadelphia. Socrata is the most popular commercial data platform provider in the United States. Socrata offers a turnkey SaaS cloud-hosted data catalog, paid for on a subscription basis. The Socrata platform includes API abilities and sitewide analytics that track consumption and engagement metrics. Socrata is used by dozens of municipal governments, including Baltimore, Austin, Chicago, Seattle, and New York City. 2014 Code for America Fellows compiled this "Open Data Portal Analysis" and detailed comparison which compares features and costs for some of the most common open data platform providers. 1. Why Does My Organization Need Open Data? Is Open Data The Same As Open Government? -Why Open Data? Why Now? -Why Is an Open Data Policy Necessary? -Which Data Should You Publish First? 1. Identify the data that supports your strategic goals. 2. Adapt your open data goals to your local context. 3. Start with the data already on your site. 4. Analyze your site traffic. 5. Analyze your FOIA and public information requests. 6. Request feedback from citizens. 8. Don’t reinvent the wheel. Copy what works. What Are Open Data Leaders Publishing? -What Apps Are Developers Building? 2-1 Open Data Principles - The set of open data principles. 2-2 Standards, Specifications, and Formats - Standards, specifications, and formats supporting open data objectives. 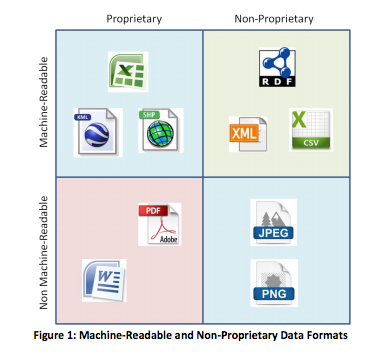 2-3 Open Data Glossary - The glossary of open data terms. 2-4 Open Licenses - The definition for open licenses. 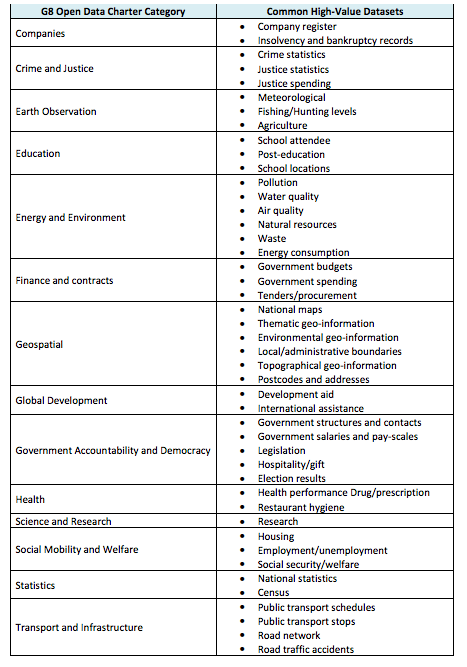 2-5 Common Core Metadata - The schema used to describe datasets, APIs, and published data at agency.gov/data. Implementation guidance for open data practices. 3-1 U.S. Government Policy on Open Data - Full text of the memorandum. 3-2 Implementation Guide - Official OMB implementation guidance for each step of implementing the policy. 3-3 Public Data Listing - The specific guidance for publishing the Open Data Catalog at the agency.gov/data page. 3-4 Frequently Asked Questions - A growing list of common questions and answers to facilitate adoption of open data projects. 3-5 Open Data Cross Priority (CAP) Goal - Information on the development of the Open Data CAP goal as required in the Open Data Executive Order. This section is a list of ready-to-use solutions or tools that will help agencies jump-start their open efforts. These are real, implementable, coded solutions that were developed to significantly reduce the barrier to implementing open data at your agency. Many of these tools are hosted at Labs.Data.gov and developers are encouraged to contribute improvements to them and contribute other tools which help us implement the spirit of Project Open Data. 4-3 Spatial Search - A RESTful API that allows the user to query geographic entities by latitude and longitude, and extract data. 4-4 Kickstart - A WordPress plugin to help agencies kickstart their open data efforts by allowing citizens to browse existing datasets and vote for suggested priorities. 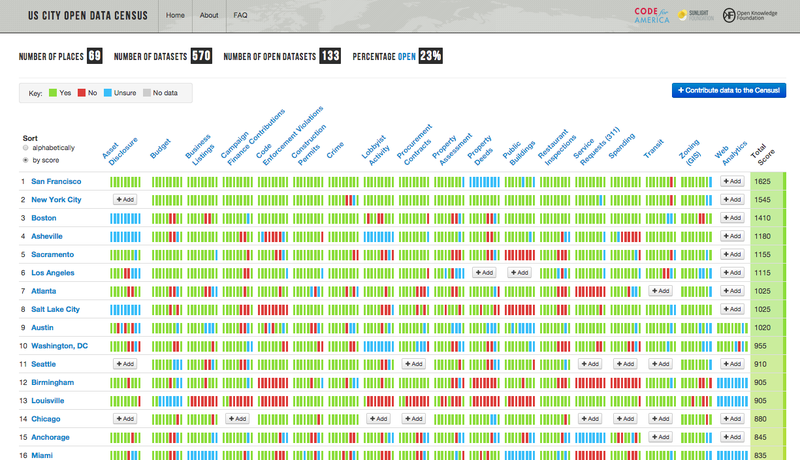 4-8 Project Open Data Dashboard - A dashboard to check the status of /data and /data.json at each agency. This also includes a validator. 4-9 Data.json File Merger - Allows the easy combination of multiple data.json files from component agencies or bureaus into one combined file. 4-10 API Sandbox - Interactive API documentation systems. 4-11 CFPB Project Qu - The CFPB’s in-progress data publishing platform, created to serve public data sets. 4-12 HMDA Tools - Lightweight tools to make importing and analyzing Home Mortgage Disclosure Act data easier. 4-13 ESRI2Open - A tool which converts spatial and non-spatial data form ESRI only formats to the Open Data formats, CSV, JSON, or GeoJSON, making them more a part of the WWW ecology. 4-14 ckanext-datajson - A CKAN extension to generate agency.gov/data.json catalog files. 4-15 DKAN - An open data portal modeled on CKAN. DKAN is a stand alone Drupal distribution that allows anyone to spin up an open data portal in minutes as well as two modules, DKAN Dataset and DKAN Datastore, that can be added to existing Drupal sites to add data portal functionality to an exist Drupal site. 4-16 DataVizWiz - A Drupal module that provides a fast way to get data vizualizations online. 4-17 Esri Geoportal Server - Open source catalog supporting ISO/FGDC/DC/… metadata with mapping to DCAT to support agency.gov/data.json listings in addition to providing OGC CSW, OAI-PMH and OpenSearch. Supports automated harvesting from other open catalog sources. 4-18 Libre Information Batch Restructuring Engine - Open data conversion and API tool, created by the Office of the Chief Information Officer of the Commonwealth of Puerto Rico. 4-19 JSON-to-CSV Converter - A handy means of converting data.json files to a spreadsheet-friendly format. A similar tool can provide basic CSV-to-JSON functionality. This section contains programmatic tools, resources, and/or checklists to help programs determine open data requirements. 5-1 Metadata Resources - Resources to provide guidance and assistance for each aspect of creating and maintaining agency.gov/data catalog files. 5-2 Business Case for Open Data - Overview of the benefits associated with open data. 5-3 General Workflows for Open Data Projects - A comprehensive overview of the steps involved in open data projects and their associated benefits. 5-4 Open License Examples - Potential licenses for data and content. 5-5 API Basics - Introductory resources for understanding application programming interfaces (APIs). 5-6 Data Release Safeguard Checklist - Checklist to enable the safe and secure release of data. 5-7 Digital PII Checklist - Tool to assist agencies identify personally identifiable information in data. 5-8 Applying the Open Data Policy to Federal Awards: FAQ - Frequently asked questions for contracting officers, grant professionals and the federal acquisitions community on applying the Open Data Policy to federal awards. 5-9 Example Policy Documents - Collection of memos, guidance and policy documents about open data for reference. 5-10 Example Data Hubs - Collection of department, agency, and program data sites across the federal government. 5-11 Licensing policies, principles, and resources - Some examples of how government has addressed open licensing questions. Case studies of novel or best practices from agencies who are leading in open data help others understand the challenges and opportunities for success. 6-1 Department of Labor API Program - A department perspective on developing APIs for general use and, in particular, building the case for an ecosystem of users by developing SDKs. 6-2 Department of Transportation Enterprise Data Inventory - A review of DOT’s strategy and policy when creating a robust data inventory program. 6-3 Disaster Assistance Program Coordination - The coordinated campaign led by FEMA has integrated a successful data exchange among 16 agencies to coordinate an important public service. 6-4 Environmental Protection Agency Central Data Exchange - The agency’s data exchange provides a model for programs that seek to coordinate the flow of data among industry, state, local, and tribal entities. 6-5 FederalRegister.gov API - A core government program update that has grown into an important public service. 6-6 National Broadband Map - The National Broadband Map, a case study on open innovation for national policy. Produced by the Wilson Center. 6-7 National Renewable Energy Laboratory API program - An agency perspective on developing APIs for general use and in particular building the case for the internal re-use of the resources. 6-8 USAID Crowdsourcing to Open Data - A case study that shows how USAID invited the “crowd” to clean and geocode a USAID dataset in order to open and map the data. 6-9 Centers for Medicare & Medicaid Services (CMS) Data and Information Products - a case study of how CMS is transitioning to a data-driven culture, including the creation of a new office for information products and data analytics, the release of open data summarizing provider utilization and payment information, and the responsible disclosure of restricted use data to qualified parties. (1) Information is not meaningfully public if it is not available on the Internet for free. (3) “Timely: Data are made available as quickly as necessary to preserve the value of the data.” Data is not open if it is only shared after it is too late for it to be useful to the public. (8) “License-free.” Dissemination of the data is not limited by intellectual property law such as copyright, patents, or trademarks, contractual terms, or other arbitrary restrictions. (9) Permanent: Data should be made available at a stable Internet location indefinitely. (12) Public input: The public is in the best position to determine what information technologies will be best suited for the applications the public intends to create for itself. Guides on "How to run Civic Hack Nights"